6 bedroom, 4 bathroom villa in the Highlands Reserve Golf & Country Club community. Owned by Dawn Axon and sisters. Ref: 2261. ARE YOU LOOKING FOR SOMETHING THAT BIT DIFFERENT? Just completed - Beautiful tiling to Living and Dining area and New Ground Floor Wetroom !! We are 3 sisters from Bolton in Lancashire, England. 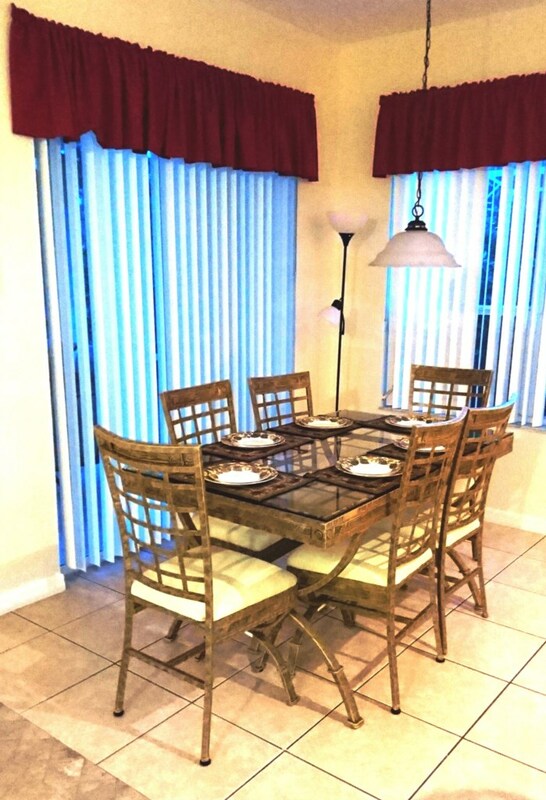 Our Florida journey began in the summer of 2000 when we decided to take a special Millennium Holiday with our parents and five young children we had between us. We absolutely loved it and returned for the next three years but though we tried various combinations of hotels and package villas, we never did find the perfect location. So we decided that it would be ideal to look for a place of our own which was when we found The Reservation on Highlands Reserve. We immediately fell in love with it’s peaceful yet convenient location and set about completely re-decorating and re-furnishing it. Well, the children now range from 17 to 25 but they still all insist on coming out every year and over the years we have found lots of different things to do - there really is so much more to see in Orlando for all ages and all interests. We are lucky to have built up a very loyal following of repeat guests from all over the world, who kindly let us know that we are getting things right and have become more like friends! We pride ourselves on our customer service and strive to ensure that our home feels like your home. We believe that we are fortunate to have made many hundreds of holidays very special since 2004 and look forward to welcoming you to our happy band of guests! 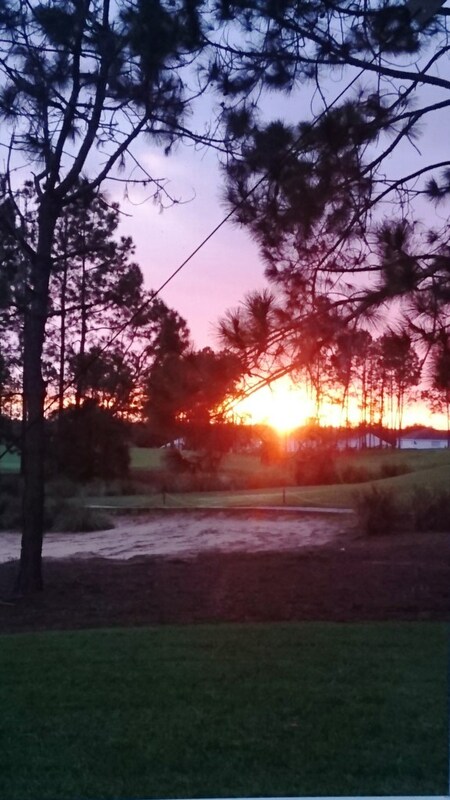 Highlands Reserve is Florida’s premium community only three minutes from restaurant, shops and supermarkets; fifteen minutes from Disney and conveniently located to access stunning beaches. 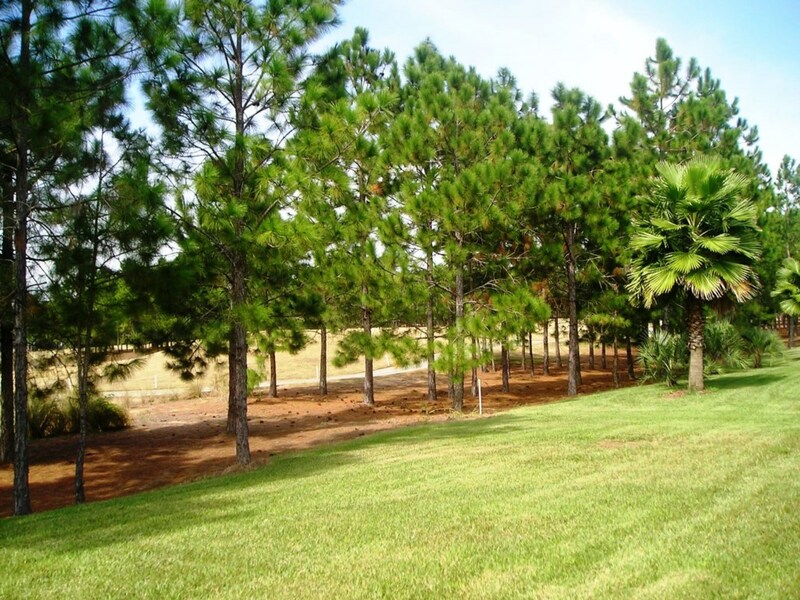 Enjoy fabulous, peaceful views over the golf course & driving range beyond but still be close to the action. After a long day at the parks will you choose a take away by the side of the pool or a meal out at one of the local restaurants? After a great game of golf will you rustle up a salad to enjoy while watching the sunset or settle to down to a home cooked meal in the formal dining room? Or will you just enjoy a glass of something cold in the spa while the kids play in the games room? * FREE LOCAL, NATIONAL & INTERNATIONAL CALLS! * ALL LINENS, TOWELS & POOL TOWELS INCLUDED! ‘The Reservation' is ideal for larger families, two or three families sharing or even a party of golfers, or smaller families who just like space! The villa will comfortably accommodate up to 14 people, with over 3,500 square feet of living space. The moment you walk into the large open plan living area and look through the windows to the pool and fabulous views beyond, you will appreciate why we fell in love with this villa! Wow! We have taken our inspiration for the decoration of the villa from the Native American Indians and it is an ideal choice for an unforgettable vacation! ********The spacious 22 foot square family room is the heart of the villa. At the end of a busy day, sink into one of the three comfortable leather sofas and watch one of the 300 channels available on the 42" plasma screen, 'SMART' cable tv. Surf the net, watch a dvd or play one of our board games with all the family. Turn the lights down low and listen to a relaxing cd the while enjoying a glass of wine. A ceiling fan creates a tropical atmosphere. ********The adjoining dining area is perfect for a formal meal with its beautiful mahogany dining table which seats ten people in comfort. For a quick snack or a more informal meal, choose the breakfast area overlooking the pool. Together with the breakfast bar this provides further dining opportunities for up to ten. ********The modern kitchen is equipped with all you require for preparing to eat in - it comes complete with oven & hob, microwave, large, double door fridge freezer with ice maker & chilled, filtered water dispenser, dishwasher and double sink with waste disposal unit. Of course we have added all the crockery & glassware that you could require as well as a toaster & filtered coffee maker. ********free high speed, wireless broadband internet connection is provided - Ideal if you need to keep in touch with work while you are away, or just if you would like to email your friends to make them jealous! Imagine surfing by the pool! ********The separate laundry room has a large washing machine, tumble drier, iron & ironing board, so there is no need to take a case full of unclean washing home to do! 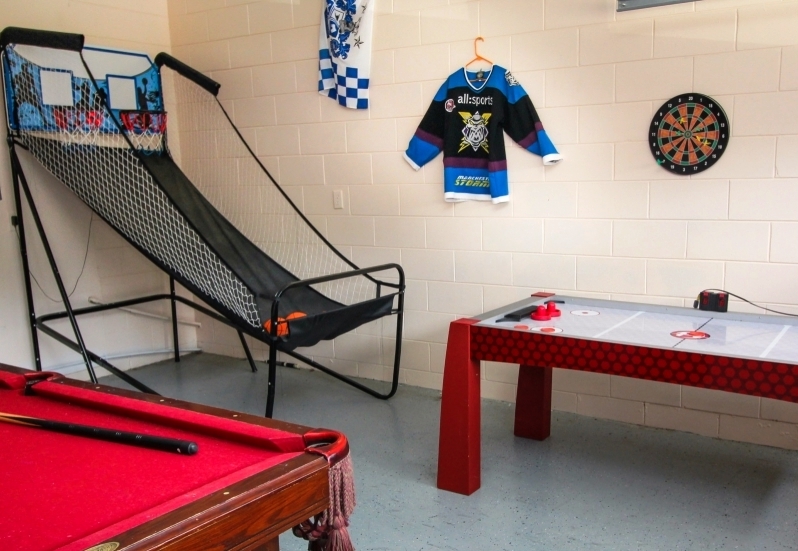 ********The games room includes a full sized pool table, ice hockey table, basketball shoot game, magnetic darts for the kids and a golf putting game. Host your own championship or simply take a little time out of the sun to throw a few arrows! 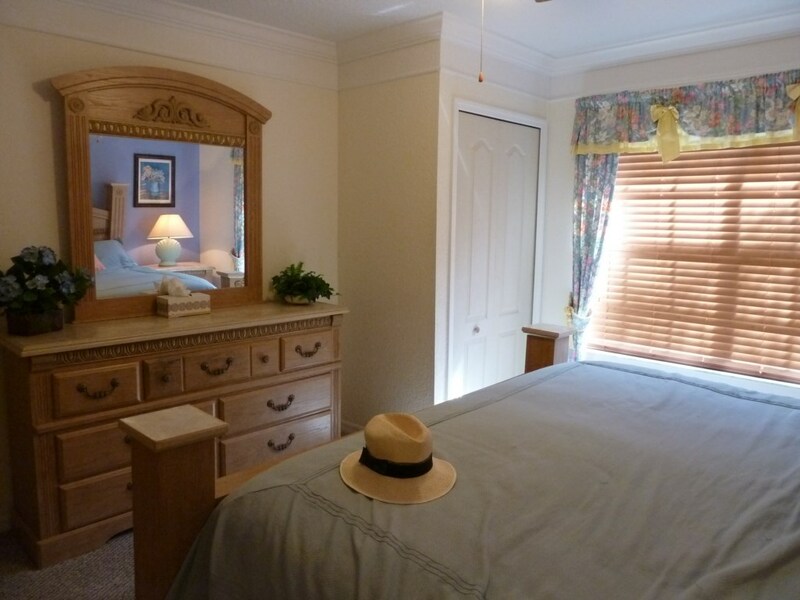 ********It is a lucky couple indeed who get to share the fabulous master suite! 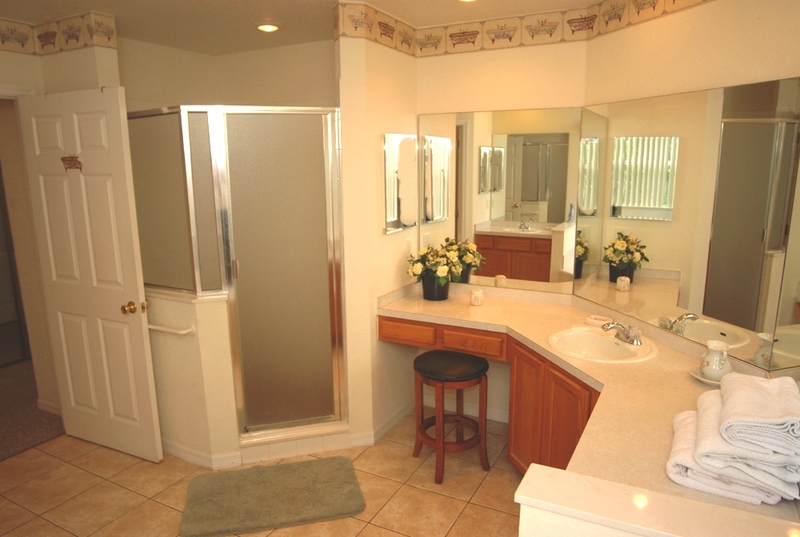 It features its own en-suite bathroom with large walk in shower, marble corner bath, twin basins with twin-lighted vanity mirror and a separate WC. There is also a dressing room featuring a large walk in wardrobe with digital safe & linen store. The bedroom itself features the beautiful mahogany king sized sleigh bed, dressing table, side tables with lamps, telephone & clock radio. Relax in your own lounge area watching the 42" 'Smart' cable tv and DVD player housed in a matching armoire. It's an ideal place to get away from it all! The centre ceiling fan & light contribute to the airy feel & the views over the golf course through the large windows are incomparable. ********There is a second king sized bed though to prevent too many arguments! The second is part of a limed oak suite and is included in a bedroom with beautiful linens & designer drapes. 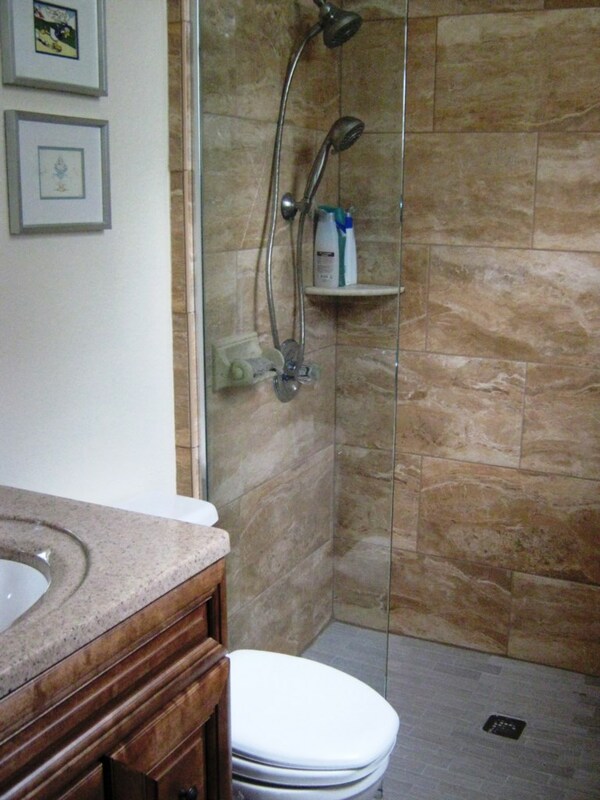 This room includes a 42" cable tv and the en-suite bathroom includes walk in shower, sink and WC. 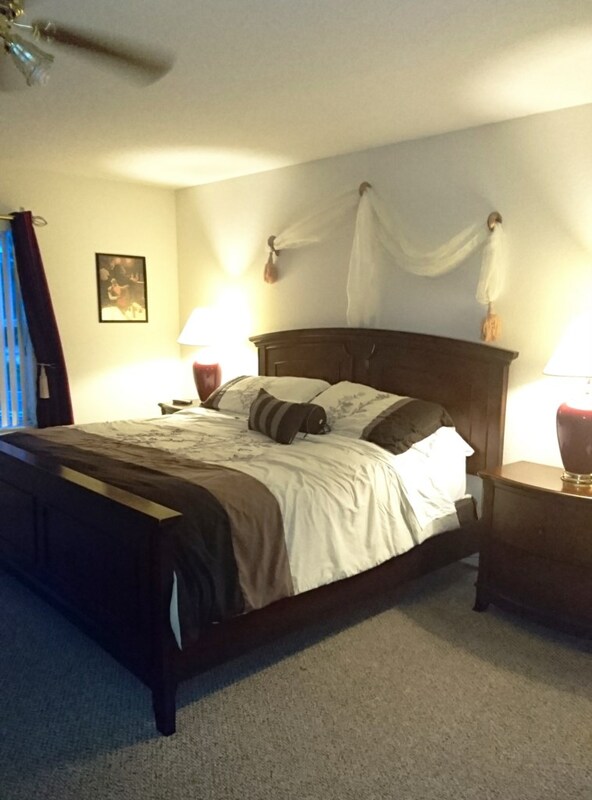 ********A queen sized bedroom is conveniently placed on the ground floor with wall mounted, 19" plasma cable tv. This room has an en-suite wetroom, which doubles as a useful pool shower room and downstairs WC. If any of our guests has restricted mobility this room is ideal, being on the ground floor and including a level access, walk in shower with dual height shower head. 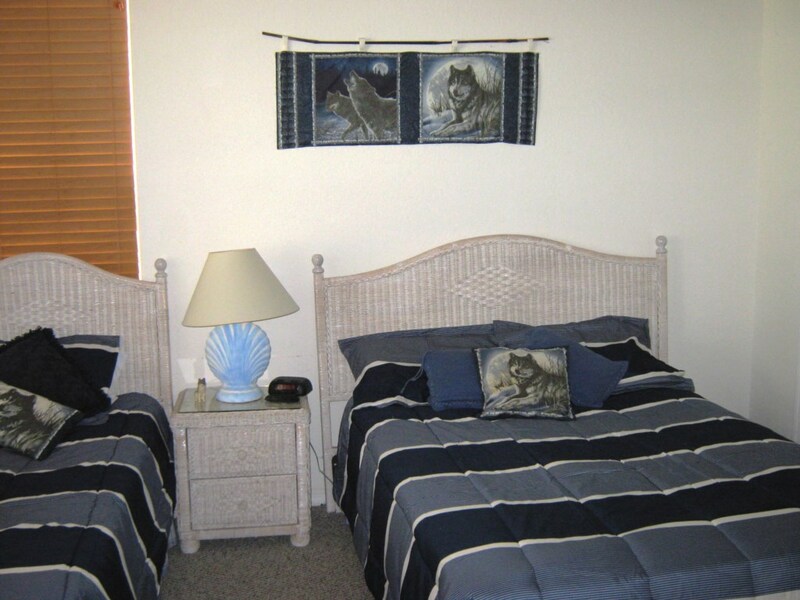 ********The Family bedroom is also located on the ground floor and is inspired by those magnificent creatures, the wolves. 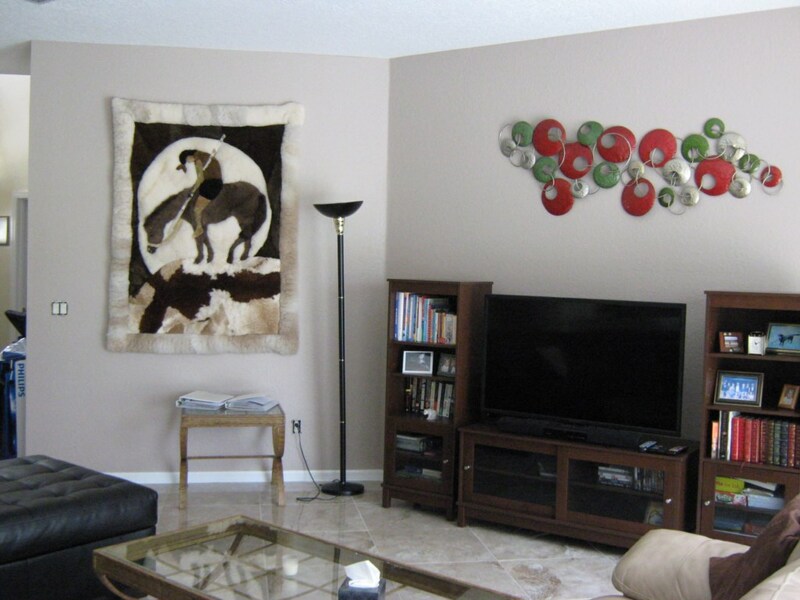 Handmade wall hangings dominate the room and like all other bedrooms cable tv, plenty of storage and a ceiling fan and clock radio are included. This room includes a full bed and a single so sleeps 3, also a rocking chair and PS2. 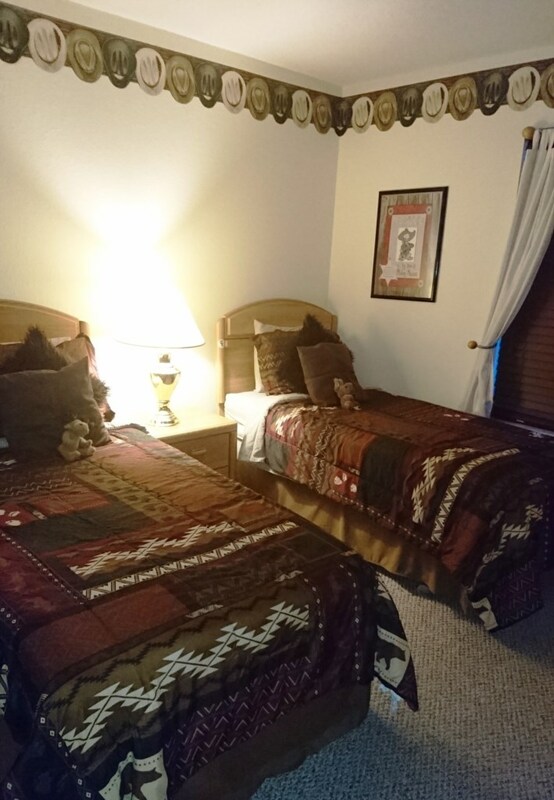 ********Two twin bedrooms are located on the first floor & share a family bathroom which includes bath with shower over, WC & twin basins with lighted vanity mirror. 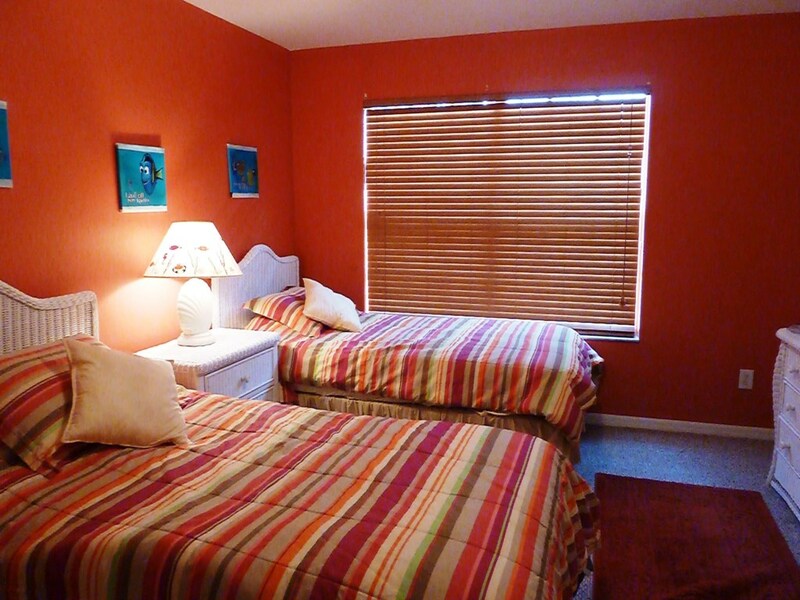 The first of these twin rooms is ideal for all ages with its light and bright Caribbean theme and 'Finding Nemo' artwork. 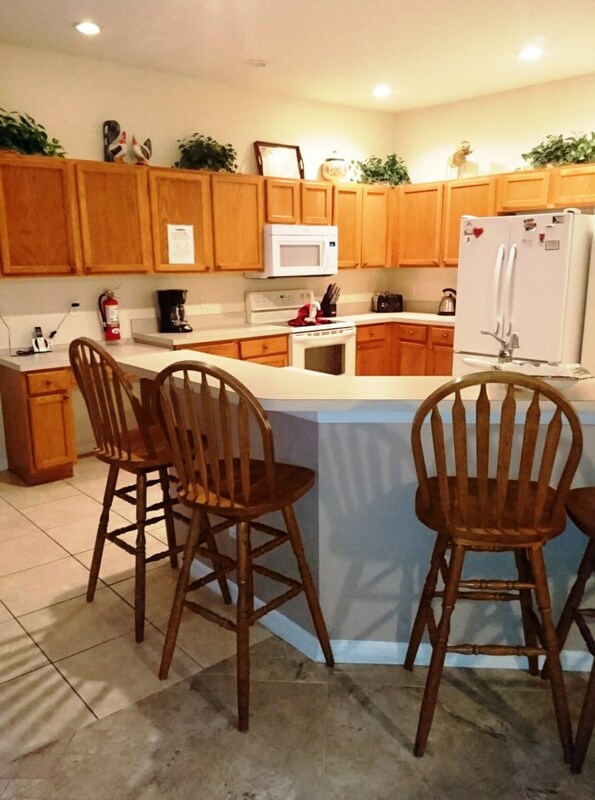 19" flat screen cable tv is included and the usual walk in wardrobe and ceiling fan. The second twin room is suitable for Cowboys of all ages and features 'Hank', our friendly cowboy and flat screen, wall mounted cable tv. 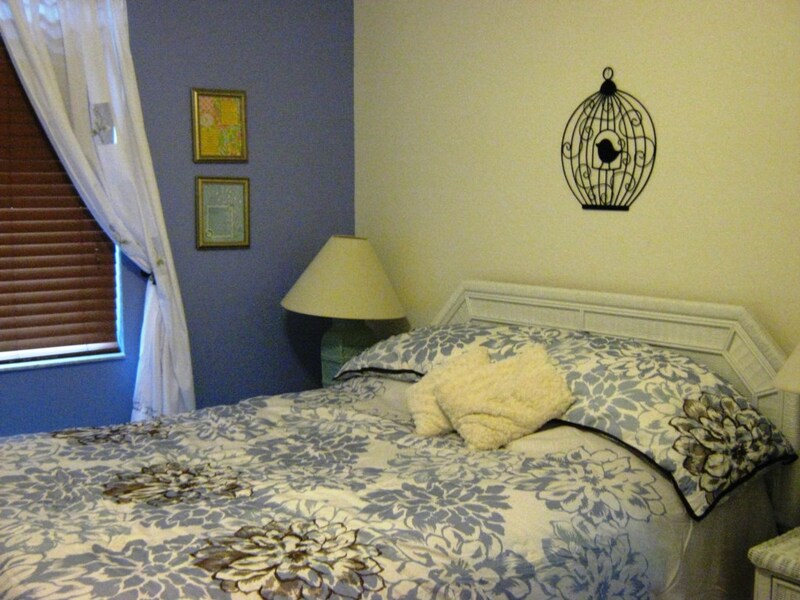 Of course all the bedrooms include large walk in wardrobes, ceiling fans & lights & clock radios. *******The fabulous pool at this villa is an amazing 30 feet by 16 feet and 6 feet deep! 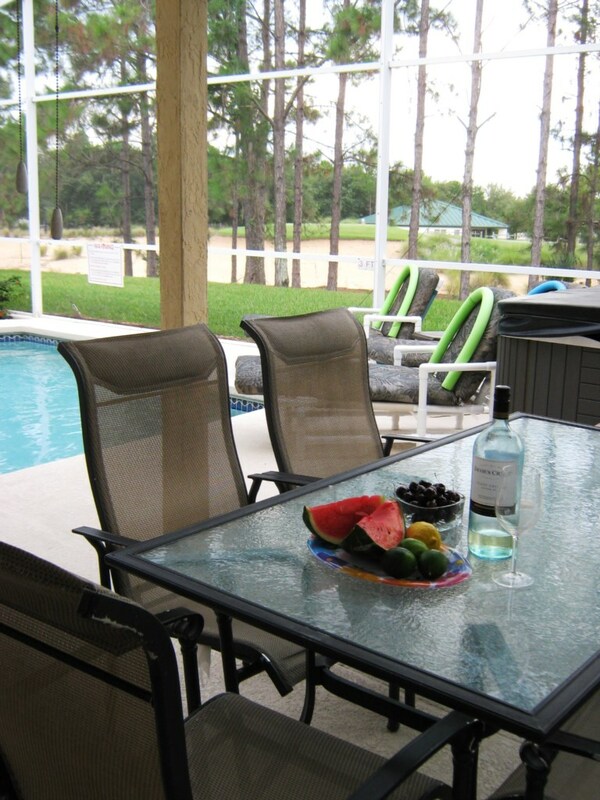 But whether you are going to try a few lengths or just relax in the Floridian sun, the patio area is just perfect! Facing the south means the pool area gets the best of the sun for the majority of the day but if that gets too much there is a shaded dining and lounging area with a ceiling fan. 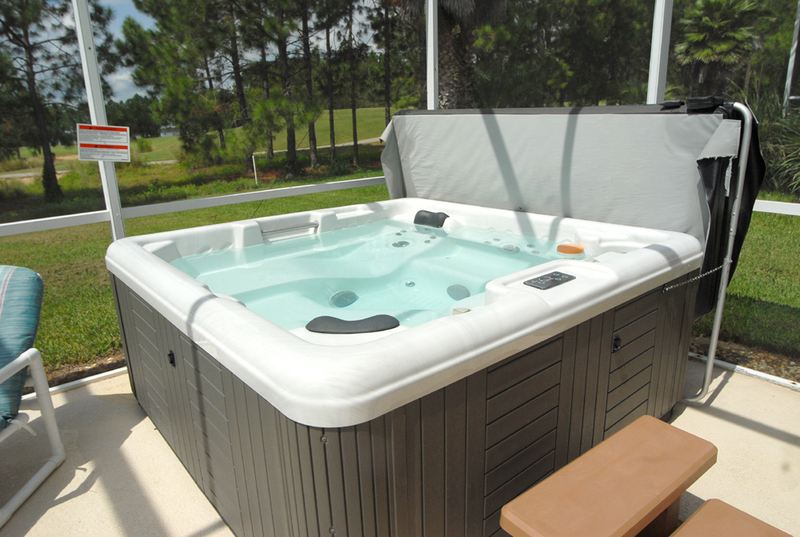 ********When the heat gets too much, try the freestanding hot tub with complimentary heating up to 104’ ; relax and enjoy incomparable views - look past the mature patio garden, through the pine trees to the first fairway and the driving range beyond. Why not plan a quiet day lazing by the pool on the padded sun loungers, taking a dip and having an al fresco lunch at the patio table? There are exterior lights for enjoying the fabulous views into the late hours. However you chose to spend your vacation, we're sure that you won't be disappointed by 'The Reservation' but don't just take our word for it! ..........Also wanted to thank you for the terrific accommodations for our family trip to Florida, the home was beautiful! Everything went terrific! 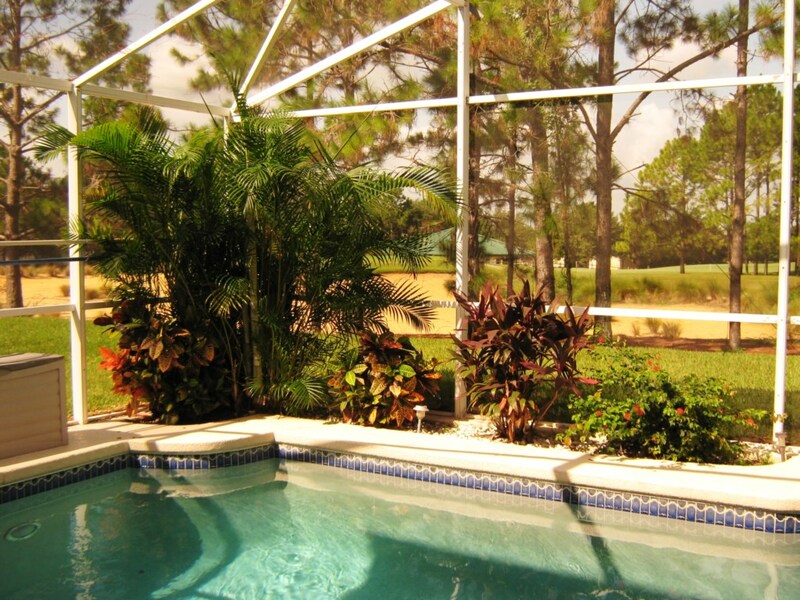 ...........My brother and his family, who flew in from England absolutely loved the house and location, when we arrived they were well settled in and enjoying the Floridian lifestyle. If possible we would definitely visit again, there is just so much to see and do in the area, and the house provided excellent accommodation, within easy access to everything. We definitely had a great vacation and will recommend Florida and your villa to all our friends and relatives; Thank you so much! Please don't hesitate to contact us for more details of how we can ensure that YOUR stay in Florida is a magnificent and memorable event. Low season prices from $1350.00 / £825.00 per week. Peak season prices from $1995.00 / £1250.00 per week. We accept bookings starting on any day of the week so you can take advantage of mid week flight rates. We are also happy to accept short stay rentals with a small administration surcharge. Can you find Nemo? 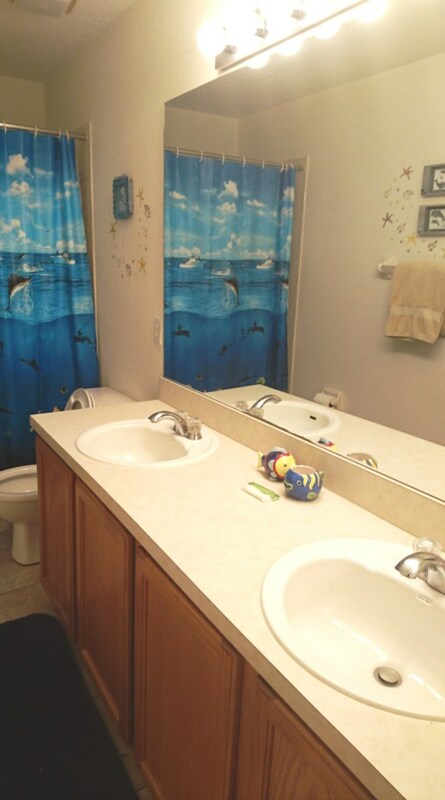 2nd King master suite Family Bathroom Extending formal dining basketball or pool? 28 Apr 2019 to 06 Jun 2019 - use the form below to enquire about these dates. Average rating: 4.6 / 5 from 25 reviews. We spent one month in this house and really enjoyed our time there. The house was spacious and the pool area lovely. There was a nice sheltered area outside as well as penty of lounge chairs. The pool and hot tub were cleaned weekly. The kitchen was well equiped with pots and kitchen utensils. Dawn emailed to make sure everything was fine and Tom the property manager was great. We had a couple of small issues and he promptly looked after them. I would recommend this rental. Owner's response: Thank you so much Barrie. We're so pleased you enjoyed your vacation. . Love to welcome you back in the future. Owner's response: Thank you so much Isobel - it was a pleasure to welcome you. Should you plan another trip, it would be our pleasure to welcome you back. We had a fantastic time at the villa and have already recommended it to our friends. Next time we travel to Orlando we will definitely be in touch to see if you have availability. We have stayed in quite a few over the years and yours goes to the top of the list !!! ...... we had a wonderful holiday thank you, your villa is beautiful, it was lovely and clean when we got there, my daughter had arrived at four and the cleaners were still there. There was everything in the villa that we needed and more ?? and the booking procedure was extremely painless. We would all definitely return to your villa it was great !!! Owner's response: Thanks Deryn - we're so pleased you enjoyed your holiday and look forward to welcoming you back again. Thank you for your email The villa was extremely clean on arrival. We had one tiny issue and the management company dealt with it immediately. The villa had everything we required. The booking procedure was a pain free experience and I can't think of any ways to improve this.We always stay in Highland Reserve. It's perfect with the amenities close by. We also feel safe in this area. 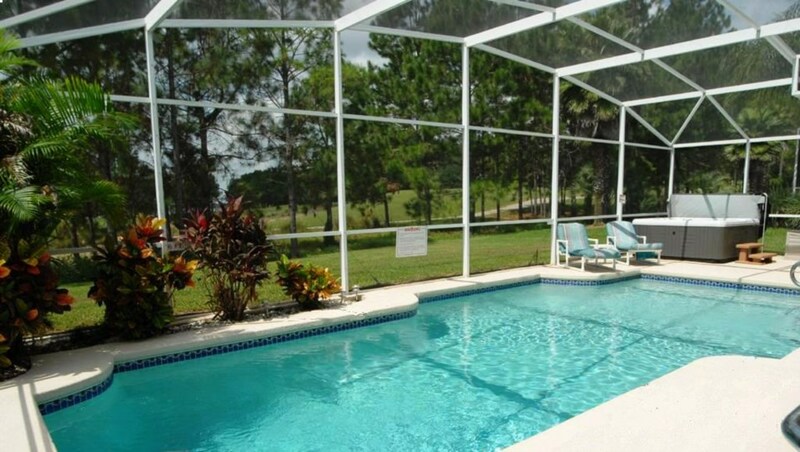 I believe we have been to Florida around five times now and It has to be said YOUR VILLA IS BY FAR THE BEST WE HAVE HAD THE PRIVILEGE TO USE .....HUGE THANK YOU. One regret .....We wish we had booked for three weeks, I believe two weeks goes too fast. I would certainly recommend your villa to anyone and I would be assured that they would be super impressed. On behalf of the family we would like to say 'Thank you' once again. Owner's response: Thank you for your lovely comments and your recommendations! YES...everything was Great like always! We are already here for 1 week....time sure flies when you are having Fun !!!! We are already talking about coming again next year. Will keep in touch with our Lovely Weather. Bye from your Sunny Florida Friends. Owner's response: Lovely to have you back again - seven times this year isn't it?!! We had a wonderful stay at your villa. We thought the place was beautiful and especially loved the hot tub. The bed in the master was so comfortable and it was a nice bonus to have the large HDTV with HD cable programming to watch in the living room. We are at the villa at the moment and the weather is glorious!! Spent a lovely day today just lazing by the pool and relaxing in the hot tub before enjoying a trip round the corner for a massage and then a lovely salad and steak from Publix! Tomorrow it's a day at Aquatica for us ?! Your villa was great and we all enjoyed ourselves very much thanks.I spoke to my wife and between us have found it very hard to think of what more you could offer - Really ever thing was first class. Will I go back to the villa yes please as soon as I have saved my pennies. Thanks again for everything. Owner's response: Thank you ! Hi Dawn...arrived home safe middle of last week. Everything at the villa was great. The Villa was perfect -spotless and Tom had the garbage put out for us each week before I even had the chance. As usual we thoroughly enjoyed our stay and wouldn't change a thing. We will probably be looking to rent again next spring...how does last two week of April look (April 19 - May 2)? Owner's response: As always, lovely to welcome you back again! Thank you for the wonderful villa. We enjoy the Florida sun a lot and the golfcourse too:) we had excellent time and everything was at we expected about the villa. I hope we will come bake to Florida in next spring so again thank you so much and have a wonderful time. Owner's response: Lovely to welcome you back again! Thank you for the loan of your wonderful villa! We had a fantastic time - thank you! The villa was lovely clean when we arrived and it had everything we needed, right down to the sterilising unit for baby bottles! The booking and arrival procedures were very smooth and we would return tomorrow!! Hello Dawn, We are now very much back in the land of normality unfortunately. We had a wonderful time there and enjoyed ourselves so much,time just flew by.Your villa was really clean,very comfortable and had a real homely feeling.Kids just loved the rooms and everything around it. . I want to thank you for all your help and info. Availability for Spring next year? We absolutely had the best time and loved your home.. Can you tell me if you have available April 2-13, 2016 ? I want to take the opportunity to thank you for allowing us to rent your villa. The Reservation is absolutely beautiful and in the short time we have been here, we have tried to treat it with the respect and care it deserves. Off to lie by the pool! Thank you for your kindness once more. Our vacation at The Reservation and in Florida went very well and we were very satisfied. The home is quite beautiful and the weather was very cooperative that week as well. The Villa was very clean and well kept, we were both very happy with the booking procedures and we cannot thank you enough for your help with that. We would certainly return again to The Reservation if the opportunity and welcome were available. We hope that the wedding you attended in Chicago went wonderfully and we both want to thank you so much again for your graciousness...we had a great time! We were very satisfied with the villa and really appreciated the early check-in. I wish to thank you for your excellent service and genuine kindness. I will certainly be in touch with you the next time we plan to travel to the Orlando area. Thanks again for everything and although it’s very cold here, I wish you and your family warm regards from Atlantic Canada! Security deposit return has been received - many thanks for swiftly returning this. Thanks again for all your help and allowing the use of your fabulous villa. I look forward to staying there again soon and will be recommending you highly to friends and family. Wishing you and your family a Merry Christmas. everything we expected - marvelous. as we might as well get something under way. Owner's response: Certainly - and I always offer returning guests our very best rate! Glad you had a good time. Wish we were back there! I wanted to say what a lovely house you have & we enjoyed our stay immensely.. So much so we are looking to visit Florida again hopefully in 2017, but with the rest of our family. Owner's response: Thanks Jane! Just let me know. I always offer returning guests our best rate. Hi Dawn, everything is great here! It was 37 degrees and snowing when we left home on Saturday and sunny and 82 degrees when we arrived here. 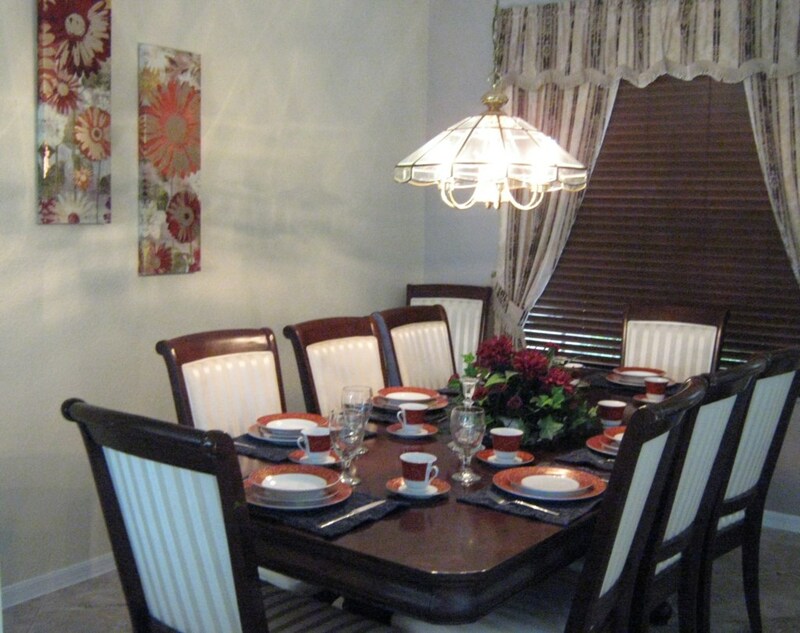 We love the changes and upgrades that you did at the house. We have been to Disney a couple of days, and are heading to Universal Studios today. Last night we spent some time in the pool and the hot tub. Thanks for checking in with us, we are having lots of fun - the house helps to make this a great family vacation. It's so much better than staying in a hotel. Owner's response: You're very welcome anytime - so glad you like the improvements! We would like to extend our huge thanks for the use of the Villa. It is certainly the best Villa we have ever stayed in and the villa exceeds all of our expectations. Owner's response: Thank you so much - we would be delighted to welcome you back! Just back home in Ireland having spent two fantastic weeks in your wonderful villa on Highland reserve. The place was exceptional and the kids just loved the pool.It was ideal for all the attractions and the directions were spot on. Thanks again and we better get saving once more as we do intend to return. Your enquiry will be sent to villa ref 2261 only. This page has been viewed 70546 times since 22 Jul 2005.